The Al Sadd Multipurpose Hall is a living example of a sustainable sports facility located in the heart of Qatar. Owned and operated by the Ministry of Youth and Sports, the Multipurpose Hall is one of the country’s most contemporary multisport facilities and it has quickly become known as the sporting jewel of Doha. With this case study we trace the development of the Al Sadd Multipurpose Hall, from its inception to the awards it has claimed, outlining our involvement in the construction of this environmentally-friendly sports complex. The Qatari government set a goal to achieve a zero carbon footprint for its 2022 FIFA games. The Al Sadd Multipurpose Hall therefore had to comply with the aggressive new environmental guidelines, and was the first sports facility in the region to follow these regulations. Al Sadd Multipurpose Hall needed to be designed to provide cutting-edge facilities for a range of activities, including handball, boxing, ice hockey, basketball, volleyball, badminton and rhythmic gymnastics. So how did this structure achieve its sustainability goals while still providing Doha with a cutting-edge training facility? powergreen made a fair contribution. 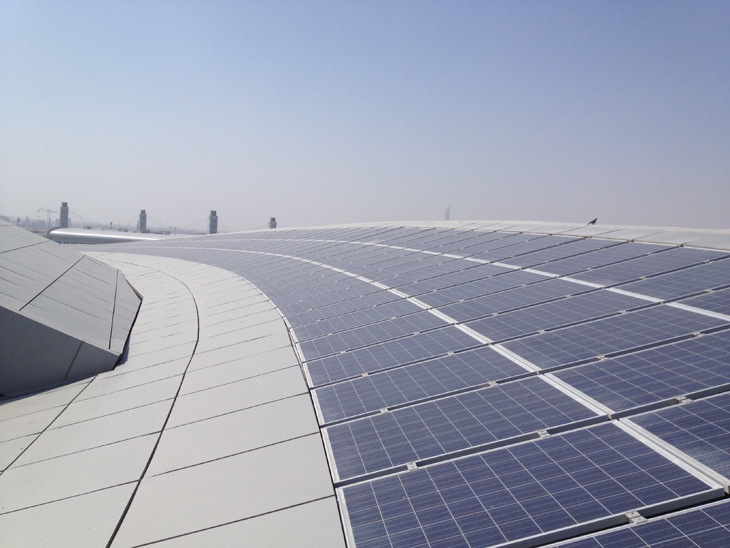 To achieve Qatar Olympic Committee’s ambitious goals, powergreen incorporated a custom photovoltaic system into the structure’s massive 1.8Km2 roof. The integrated system provides the structure and surrounding area with an impressive 275kW of solar electric power with the potential to offset nearly 150 tons of CO2 emissions every year. The project started with custom polycrystalline PV modules provided by Austrian manufacturer KIOTO and was delivered through the capable expertise of powergreen technicians. The structure’s distinct curved shape and wavy rooftop meant that a completely customized installation process had to be developed. Though the installation was more challenging compared to flat roofs, the final results were worth the extra effort. The unique panel arrangement was the first of its kind installed in Qatar. With such a unique solution, it’s not surprising that the Al Sadd Multipurpose Hall caught the attention of the region’s construction industry, going on to win the Sustainable Project of the Year at the 2015 Construction Week Awards. Today, the hall plays an important role in the lives of many Qatari athletes. Interested in learning more about sustainable projects across the Middle East? Check back for weekly updates and the latest news and if you haven’t already, be sure to join us on Facebook, Twitter and LinkedIn for even more updates.